Small business owners say they're too busy thriving on Main Street to worry about the gloom and doom on Wall Street. Spend enough time following the news, and it's enough to make you wonder if Chicken Little was appointed chairman of the Federal Reserve. Granted, things like the dismal housing market and soaring gas prices are certainly real problems for everyone. On the other hand, when you read about some cubicle jockey complaining that she had to give up Starbucks because the economy's so bad, the line between real problems and a dire shortage of common sense becomes pretty blurry. So, is the sky really falling? According to a March 2008 study, small business owners say no. "The entrepreneur is still thriving," says Rick Jensen, senior vice president of small business for Intuit, the company that conducted the survey. "It goes back to the roots of who these small business owners are. They've faced adversity and they play offense. This isn't news to them." The study, which sampled 751 small business owners with 100 or fewer employees, found that 90 percent of those surveyed said they see opportunity in the current economic climate and 75 percent said they expect their business to grow. About half said the economy levels the playing field between small business and their larger counterparts, and 65 percent said they've had experience guiding their business through tough economic times. Their focus, to the tune of 63 percent of those surveyed, is customer retention, something Jensen says is a big part of what drives small business owners and allows them to do well under any economic conditions. "They're in a unique position based on where they come from," he says. "They think fast. They're much more in a position to move very quickly in terms of how they align their resources. They're used to doing that anyway, in good times and bad. It goes back to the reason they got into it in the first place--passion." Joe Gebbia, 26, is no stranger to the sort of passion that can lead to a groundbreaking business. As an art and design student in Rhode Island, he endured long critique sessions that often involved sitting on uncomfortable benches for hours. When his search for a suitable seat cushion came up empty, he designed one of his own, and Critbuns was born. "I feel like I've been an entrepreneur my whole life," Gebbia says. "I tried to fall in line with everybody else because I felt like that was the thing to do. I'm glad I did it because I learned a lot, but I'll never forget the day when I made the decision to finally go into my company full time. It was an amazing feeling." Critbuns' sales tripled in 2007 after being featured in several major catalogs, landing in four international retail outlets and offering direct online sales from its website. 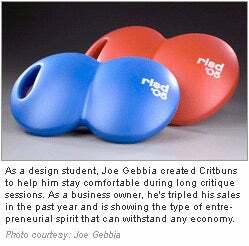 Gebbia says his success and that of his fellow entrepreneurs is as much about attitude as it is about business sense. "I think it's a character trait," he says. "There's a quality that somebody has that they have to like the sense of adventure. You go into it being uncertain, so if there's a recession, who cares? Why would I let the forecast of a recession bring me down? I don't see it any other way. When things are good, you're confident. When things are going bad, you're confident. You're your own biggest cheerleader as a small business. If I'm not rooting for myself 100 percent, how can I expect anybody else to?" Other entrepreneurs have managed to thrive in a slow economy by combining the usual innovation with a healthy dose of good karma, a very marketable commodity in any economy. "One of the things that helps is that we have a double bottom line," says Pankaj Shah, 34, founder and CEO of GreenDimes, an online company based in Palo Alto, California, that removes subscribers from junk mail lists and plants trees on their behalf. "I think people are willing to help themselves and help the world. We have kept it simple. Everyone gets junk mail at their house, and no one likes it. With us, for $20, you can get rid of it and do something good." The company, which started in 2006, is already posting eight-figure revenues, with 2008's numbers projected to triple those of last year. GreenDimes also sells high-end T-shirts, with a portion of the profits going to charity. Shah says part of what has helped his company thrive is its ability to make doing the right thing easy. "Everyone doesn't have time in their day to become an activist," he says. "But I do think most of the population wants to do something good and give something back. It's hard to figure out all the things that are broken in the world. So we decided we're going to sell these products and services, and these things are going to be good 100 percent of the time. And we take care of the part where you do something good in the process." Despite what's being said about the dismal state of the economy, Shah says being an entrepreneur gives him hope because he sees the sort of creative thinking he hopes will change the way business is done--and he hopes his business model will be part of that revolution. "There are more smart, driven, educated people trying to do good things in the world now than there have ever been," he says. "I see the light at the end of the tunnel. There's some business model that's going to prove you can have this thriving business entity that puts pieces of society on its back and says, 'We're going to make this better.' And it's not preachy. It's just fun, hip and interesting. I hope it's the wave of the future. You can buy our T-shirt, and three kids in Africa won't die from a bug bite. Those are the kinds of things consumers can relate to." Besides small businesses being better equipped to handle a slow economy to begin with, Jensen says, the current economy actually favors them because as larger companies struggle, their customers and even their employees will flock to smaller ones. "I think small businesses have a unique opportunity," he says. "As you see larger companies downsize, you're going to see Middle America turn to small businesses. Small business will be a place where the middle class will find their middle class wealth again. The thing about America is that the entrepreneurial spirit has never been stronger. Small businesses are where people are going to want to go to work. What people are going to see is that, as small businesses continue to grow and be a more important part of the economy, it will fuel entrepreneurship even more." Justin Petruccelli is an associate editor for Entrepreneur.com. He can be reached at jpetruccelli@entrepreneur.com.